This is a screenshot of my alternate (and dead) Multiply site. Back in May last year, I deleted my @rainbowdoll site and my Friendster page. Out of boredom last night, I opened this again and was shocked to see at my old blog entries. Those posts were cross-posted from my old Blogspot, Xanga and LiveJournal accounts. I cannot believe it. Many of what I've read were memories from sophomore year. Imagine that? It's been TWO YEARS since I made all notoriety in my online writing. There were lots of revelations and shockers in the picture: I once hated Facebook, 2008 was a horrible year and I kept on posting things a lot of people think reveal my naive nature. I also saw three of my albums. The photos were taken from a camera phone and a webcam with very poor resolution. Like the blog entries I rediscovered, I want to laugh at how screwed I looked in my old pics. It was too pejorative to pose like a skunk then upload them like no one's viewing. The reminisce of my dreckitude definitely made my night. Posted on Sunday, February 27, 2011 at 1:15 PM. 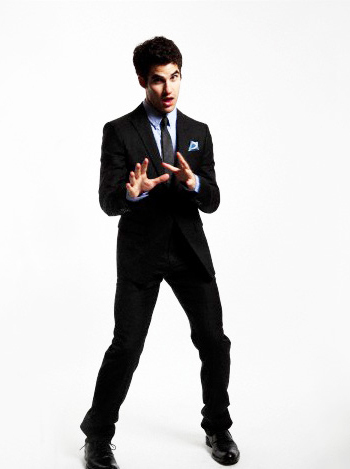 Darren Criss, Candy Mag, Etc. I don't buy Candy Magazine anymore because I'm getting tired of the same covers and topics over and over again. The only good thing about the March issue is Glee's Darren Criss. His character and voice is very breathtaking. Unfortunately, I won't buy the issue because Taylor Swift looks rubbish in the cover and Archie's there - for the millionth time. Seriously Candy, aren't you getting tired of recycling your ideas? I've seen those things in the past already. It's true that I am not into things that most people rave about. I am not into hip-hop. I'm not addicted to Twilight. I don't have K-pop on my music playlist. I don't watch tween shows in ABS-CBN and GMA because those kids are only famous for their already-overhyped looks. I'm happy Shoutout was cancelled because the stars only showed off their "glorious" appearances but they have subpar talents. I've seen a lot of ordinary people who look more or less like them. 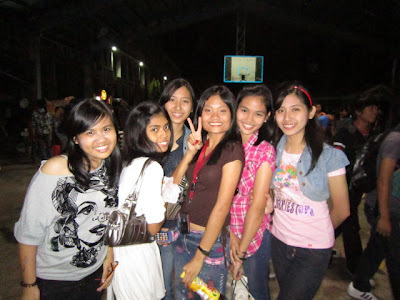 And I agree with a classmate who said that there are many pretty celebrities in Channel 2 but NONE of them stands out. Nakakasawa na iyong mga pagmumukha nila. Marami pang mas magaganda sa kanila na hindi celebrity. I'd rather watch Glee, thank you very much. I want to see more of the Cheerios and less Rachel Berry though. Posted on Friday, February 25, 2011 at 8:44 PM. On March 15, 2011, The Candydoll Files will be celebrating its THIRD birthday. Yay!!! I cannot believe I currently own a very active blog serving more than 4000 viewers (according to the site counter), 284 posts at archive and more than 20 affliates. I'm thinking of this special blog thing called The Candydoll Project. Coincidentally, March will be the month I'll graduate from STC QC. To kick things off, I'll browse all of my posts from the very first one and select those that made a big impact in my life. For example, my posts from freshman year, sophomore year, blah blah and the like. Then I'm planning to make a 10-post meme to commemorate The Candydoll Files and its three years of existence. You'll be able to know more about me, so watch out for it. I'll be thinking of many other creative ways to make The Candydoll Project a memorable one for my blog. Just keep the views counting and you might see a new update about it now and then. Posted on Wednesday, February 23, 2011 at 9:18 PM. Nine more days and I'll no longer stay up late to do my homework. Nine more days and there will be no more discussions in class. And in less than a month I'll be marching down the aisle in the GS gym - one last time. Forgive me if I haven't blogged a decent entry lately. I haven't glanced at my Facebook news feed for two weeks now because I'll read nothing but people wanting to deactivate their accounts because of schoolwork. Twitter is full of tweets from batchmates complaining about lack of sleep. Unlike last year, there's a day without a post on Tumblr. My aunt would yell at me every school night to go to bed but I can't because I'm studying for a quiz and reading my lessons. FAST FORWARD TO MARCH PLEASE. I AM SO TIRED OF STUDYING. Posted on at 9:09 PM. I totally love this cover from a very talented Filipino girl who resides in Canada. Her brilliance in singing and playing the piano brought Lady Gaga to tears. In fact, they already did a duet of the song together. Just look it up on YouTube if you have the free time. As you could see in my layout, I removed the link to my Facebook page. To tell you the truth, my profile is restricted to friends, classmates and close networks only. I know it sounds a little cliche but I ignore friend requests from people I don't know. This is one way to maximize my privacy online. If you want to connect with me, I suggest you follow me on Twitter instead - but please be patient to accept your follower request because I check it every one or two weeks. It's because I'm stuffed with a lot of things right now. I haven't told you I have braces already. I acquired them last Saturday, so it's been a week since I had them. It was a big pain in the neck during the first week; I couldn't eat normally because the meat hits my molar bands and it hurts so much. I don't have the freedom to eat hard foods such as chicharon now I have metal brackets and a bite block to match. I have to wear a bite block for three weeks. Thank goodness I won't be wearing them on March 18. When I arrived in school the following Monday, the IV-3 people asked me what's found in the bottom of my teeth. I told them it was a bite block and the purpose of wearing it is to remove my crossbite so I can have the brackets on the lower side sometime next month. Now our home has WiFi access, I get to use my laptop more often. Meet my desktop with a Leighton Meester wallpaper courtesy of Deviantart. There's my Rocketdock, a chat with Dad (can't tell you his e-mail, sorry! ), Tweetdeck and Google Chrome. This is a Windows XP desktop with a Windows 7 look. How desperate I am to dump XP :)) I am hoping for a Mac or a Windows 7 OS one day before I go to college! Changed my Tumblr URL once again. @dolledupinplastic flopped bigger than @thesummerlights. (Sad but that's the truth. LOL.) I gained like one follower each day and that's it. If you have a tumblelog, then this is worth following. I post a lot of pretty pictures and fashion stuff there. Mind-boggling randomness post coming up. And it's one thing that's interesting me for a while now. Posted on Saturday, February 19, 2011 at 9:54 PM. Posted on Sunday, February 13, 2011 at 11:45 PM. Thursday was Oral Defense Day. I thought it was difficult but it turned out to be easier than expected. Thank you groupmates and queue cards. BTW, I slept close to midnight just to memorize and fully understand the material. Now I'm feeling the college hype. I browsed a Facebook page for the Big 3 universities (UP, ADMU, DLSU) and clinched at the admission rate for the next school year. Can you believe that there were more applicants in La Salle than in Ateneo last year? DLSU accepted only 3,000 out of 27,000 hopefuls while ADMU welcomed 2,700 out of 13,000. Now instead of whining that I won't be a Blue Eagle while everyone else is, I should be thankful for being one of the few who got the chance to study in a very prestigious and competitive university. Posted on at 7:23 PM. J Biebs: Hot or Not? While I was backreading my dashboard on Tumblr, this post struck my attention. It was all about Justin Bieber, probably the biggest teen superstar today. In 2008, everyone was crazy about the Jonas Brothers. They grew old, Kevin got married, they changed their image...and lost the popularity they once had. Where are they now? GONE. Their last album, Lines, Vines and Trying Times, didn't sell that much. Now 2010 emerged a breakthrough in teen music with the creation of the Canadian heartthrob. Bieber's music video "Baby" hit over 400 million views making it as YouTube's most watched of all time. He was on countless magazine covers all over the world. 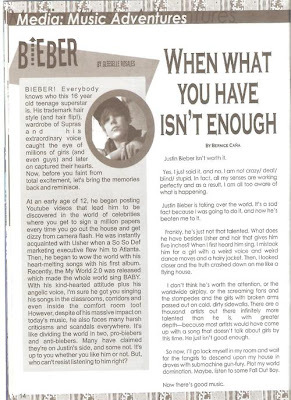 He made about 10 singles in the previous year alone. He won "Artist of the Year" in the American Music Awards. This month, he's set to release his 3D movie. He's one of the few teens who has a cover story at Vanity Fair. A million girls are screaming over him. He's almost always a trending topic on Twitter. And like any other singer, he cannot please everybody. The world is now divided into two: Beliebers and anti-Biebers. He gets critcized for his effeminancy and his squeaky singing voice. Several celebrities think he's overrated. He's on TV almost everyday. His songs are way overplayed already. A lot of people think he doesn't deserve all the attention he's getting like the writer in the article said. Well, there really are a lot of singers who are much better than him. There are a lot of non-celebrities his age who are more handsome and talented than him. And for instance, the heartthrob status is sure to go away after a given period of time. Once upon a time, everyone hated the Jonas Brothers when they were the Kings of Teen Pop. Now they're losing to Bieber, everyone wants them back. In my opinion, Justin Bieber should enjoy his current fame because in two years or so, there's a great chance he'll get replaced by someone younger and fresher. Now that's how the entertainment world works. Only the most talented and charismatic survive. Posted on Sunday, February 6, 2011 at 2:54 PM. Posted on at 2:36 PM.